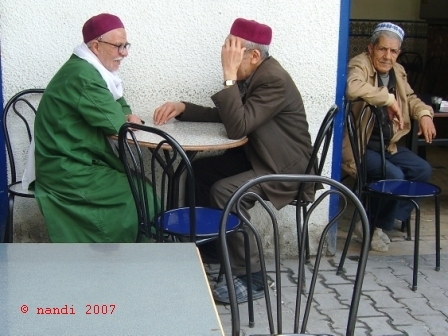 “Tunisia is wonderful and very different from Libya! It has a weather,” Fatia, a young Tunisian IT student we met in Libya told us excitedly. “And the food is better. For breakfast we have gateaux or ice-cream!” So we expected bluer skies and pastry shops at every street corner. But when we arrived in Tunisia the weather was similarly cloudy and rainy as in Libya (perhaps we just hit an unusually cloudy time in both countries). There were some nice patisseries in Djerba, but none of them sold delicious ice-cream. Further north, the vegetation was markedly different: Rolling green hills with lots of spring flowers and wheat fields. Without the olive trees, you could imagine being in Bavaria. No wonder that the Romans liked the area and settled here once they had defeated Carthage. Beside Carthage, we went to see the ruins of four small Roman towns in the northern country side of Tunisia. Although not as impressive as the marble columns of Libya, they were charming and interesting in their own way. In all of them, well-preserved mosaics have been found, and some are still in situ. Walking around the ruins you suddenly almost step on a colourful representation of Roman gods or local animals. In the Roman town of Bulla Regia, the inhabitants developed a unique architectural style to cope with the heat. They built their bedrooms and main living quarters in the basement of their houses, with light shafts and a courtyard leading through to the basement level, while on the ground floor, they had just representative rooms. Dougga, the largest of the Tunisian Roman cities and also a World Heritage Site, had some similar houses. With small winding roads, richer villas on the outskirts, and orchards beyond, Dougga must have been a pleasant and peaceful town to live in. We also visited a well-preserved Roman Forum with three almost intact capitol temples in Sbeitla/ Sufetula and a huge free-standing amphitheatre (collosseum) in El-Jem. Apart from its Roman heritage Tunisia is also home to some very early mosques. They were built by the first generation of Muslim warriors who set out to conquer the Maghreb and eventually Spain. The most famous one is the Great Mosque in Kairouan: It is so holy that seven pilgrimages can replace the mandatory pilgrimage to Mecca. The caretaker gravely points to Natascha. “Repeat after me,” he says in French, and continues in Arabic: “There is no God but God!” We had been the only women in the mosque wearing a headscarf, so he may have considered us prospective convertites to the Islamic faith. "Uh, hm, but we don’t know enough about Islam. And we are Christians...” we worm our way out of the conversation. Different from the other Arabic countries we visited, Tunisian mosques have special tourist-only hours. During these times, an admission fee applies, but nobody insists that you remove your shoes, or that women should wear a headscarf. “Is this a mosque, then? Is it possible to enter?” we hear a group enquiring in German at the entrance of the Great Mosque in Sousse. Apparently they find the 3 Dinar entrance fee too expensive, and we remain the only visitors for a while until a French family joins us. Tunisia is decidedly a package tour destination. We never met any backpackers, and only very few independent travellers – all of them with their own vehicle. Around noon scores of German, French, and British beach tourists in shorts, proudly displaying their sunburnt knees and bellies, trawl along the main streets of the medina, the old town. They come by bus from their resort hotels in the zone touristique that every Tunisian town has, and stay only for a few hours. Then the desperate souvenir sellers grab them, preferably the women, by the arm to draw them into their shops. “Bon soir,” someone shouts, and another one, in German, “We are cheaper than Schlecker discount!” The latest BILD and Daily Mirror are available at the newsstands, but no other German or English newspaper (the French can buy Le Monde). In the evenings, when all the tourists have gone back to their beach hotels, most shops and restaurants close. Those restaurants still open specialise in couscous and sandwiches, and a number of patisseries sell puffy French-style cakes and sweets. We never had ice-cream for breakfast, though.